Paul Strayer was born in Park Ridge, Illinois in 1885. Primarily a self-taught artist, Strayer did take some formal training under the tutelage of John H. Vanderpoel, an artist and teacher best known as a figure drawing instructor at the Art Institute of Chicago. While developing his early illustration and design career, Strayer met Howard Pyle who was teaching at the Brandywine School of Illustration in Wilmington, Delaware. Strayer documented in his journal that Pyle urged and encouraged him to ". . . keep your values close, don't break up the masses with uneasy detail. "Strayer would take this advice to heart as over the next decades he would produce illustrations for such classics as Robert Louis Stevenson's Kidnapped, Rudyard Kipling's, Tales of India, Nathaniel Hawthorne's, The Scarlet Letter and the majority of the Zane Grey western novels. Strayer also created murals for Marshall Field's in Chicago, produced covers for Street & Smithmagazine with numerous illustrations for the publishers Houghton Mifflin and Doubleday. Illustrations by Strayer also appeared in the Saturday Evening Post, Outdoorsman and Time Magazine. The artist was an extremely private person who shunned publicity and preferred to work in his home and studio, which he had managed over the decades to fill with Native American, Western and nautical themed objects including his formidable reference library and photo archive. Even though Strayer was showing at the Art Institute of Chicago as early as 1918, he didn't pursue or seek exhibitions or accolades. In 1942 at age 47 he was invited to join the Association of Chicago Painters & Sculptors, which he did but resigned eight years later. As he explained "Modern tendencies in art so upset me. I find myself in a morass of modern corrupt tendencies (as I see it) and am convinced of the uselessness of it all". 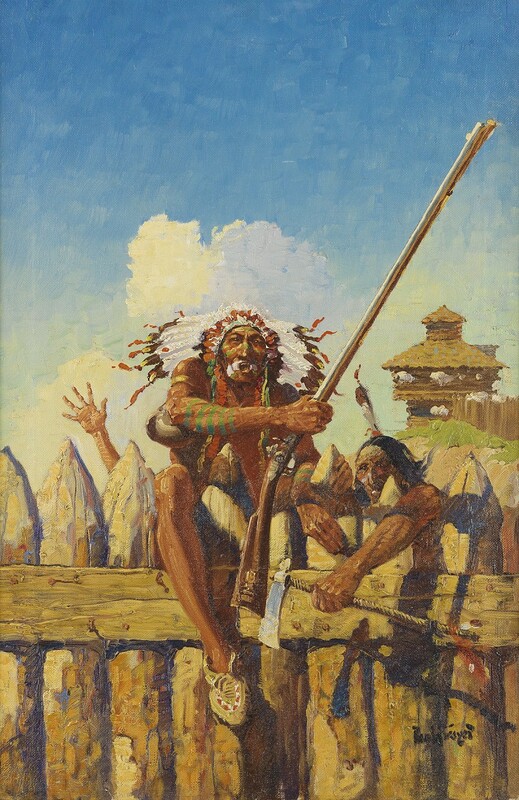 Inspired and motivated by artists such as Frederic Remington and Charles Russell, Strayer evolved into an authentic portrayer of the Old West with dozens of painting attesting to his ability to capture the light, mood, landscape and persona of the Western frontier. A self-effacing and meticulous artist, Strayer had a great love for animals, especially the horse whose strength and nobility was stressed throughout his fine art. Submitted by Thomas De Doncker, Fine Arts Department Director, Michaan's AuctionsSources: Peter H. Falk, Who Was Who in American Art: 1564-1975, Sound View Press, Madison, CT., 1999, Vol. III, p. 3201.Peggy & Harold Samuels, Encyclopedia of Artists of the American West, Castle Books, Seacaucus, NJ., 1985, p. 470Paul Strayer (1885-1981), Campanile Galleries Inc., Chicago, Illinois, 1985, (exhibition catalog).